The November model will be Eleanor (not our Chairman!) who is a dancer. The session will be comprised of short and medium length poses and promises to be interesting and inspirational. Selection day for Forum exhibition is Saturday 6th April. At Nelson st First School, Norwich, NR2 4EA. Please bring works for submission between 8.30 and 9.30am. Details are on the submission forms sent with the last newsletter. Bring your submission fee and your 2019 membership fee if you haven't already paid. Submissions will only be accepted from members whose subscription is up to date. Do come along and support your Art Circle if you can. Please remember to bring your membership fee for 2019/20. The fee is £20 for a single person and £30 for a couple. The agenda for the meeting can be found in the "Newsletters" section of the website. We are very grateful to Sue Williams for stepping in at nearly the last minute to do a pen and wash demonstration, after Malcolm Jarvis had to cancel. It was a very inspirational demonstration, with Sue doing 4 different paintings. She started using a Sharpie pen to draw and shade a garden shed, then added some watercolour to add more life to it. Chickens were drawn with a scribble technique and Pansies with a continuous line to show the different effects. Another was done with a wooden stirrer dipped in Sepia Acrylic Ink which gives a lovely broken line of different thicknesses, again some colour was added with Inks and watercolour. Social Gathering - dates for 2019 New venue please read. Workshop with Rachel Thomas Saturday 9th February - now fully subscribed. 10am-4pm Nelson Street First School, Norwich. Subject: Landscape multi media, bring own reference. Members £25, non members £30. To secure a place please send a cheque, made out to Norfolk and Norwich Art Circle to Jan Motley, 22 Summer Close, Framingham Earl, Norwich, NR14 7TN. Places will be allocated on a first come first served basis. Demonstrations are free for members. Unless otherwise stated please arrive promptly by 1.45 pm. Booking is not needed. Non members welcome for a nominal charge of £3-£5 per demonstration. Workshop with Liz Balkwill, Still Life in oils or pastel. The workshop was about the setting up of a simple still life. We were asked to bring three or more objects and oil paint or pastels. Liz began the day with a lively and interesting demo. She gave us ideas about successful ways to set up our objects within a three cornered board. 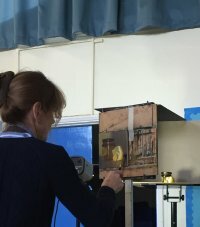 She encouraged us to look at the shapes and pattern of the items within the space Then beginning with the first tonal layer of paint, we watched her gradually building up the colour using freshly mixed “piles” of paint. Liz told us that she actually keeps her palette in the freezer which keeps it all fresh and clean to use again! Each of us then worked individually on our own arrangements and most certainly achieved great results, because at the end of the day our paintings made an impressive display! We hope you are able to join us for this Autumn gathering. Drinks will be provided. If you are able, bring some finger food to share. This is an opportunity to bring along work not accepted at selection for further comment, bring work in progress for comment, bring surplus materials to sell to members, bring a postcard size example of your work to swap!!! Or just come along and chat !!! 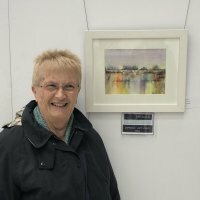 The winner of the Jarrold Art Prize at the 2018 Forum exhibition is Sue Willmer with her watercolour, Wetlands. Congratulations Sue! Sue wins a selection of art materials from Jarrold of Norwich. Thanks go to Jarrold of Norwich for their generous support. Robert, who works in oils and watercolour and works often en plein air, will give us an oil landscape demonstration. The demo will be held at URCH. Arrive by 1.45pm, demo finishes at 4pm. Free for members. Non members also welcome for a small fee. Join NNAC on the day and get the fee refunded! No need to book, just turn up by 1.45pm sharp! 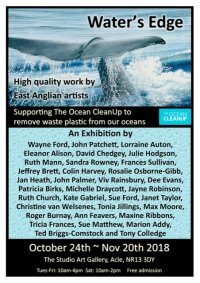 The exhibition will be held at the Forum, Norwich starting on Sunday 30th September and closing at 3pm on Saturday 6th October. 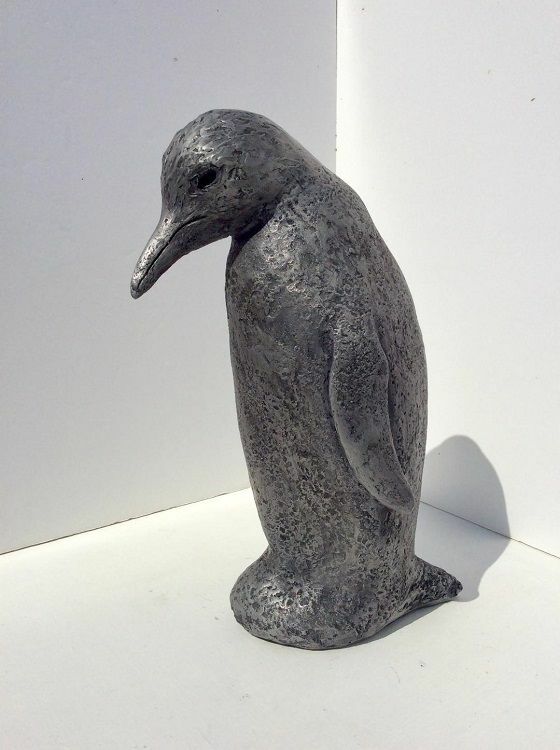 A small selection of work which will be on show can be found in the gallery heading on the home page. Ten members braved the drop in temperatures to paint in the wonderful surroundings of Kirstead Hall. We were made very welcome with coffee and tea readily available and enjoyed painting, drawing and sketching in the late summer sunshine. Thanks to Rae Dunthorne for getting this arranged for us. Demo, John Patchett, Saturday 21st July NELSON ST First School. 1.45pm to 4pm. Please note venue! 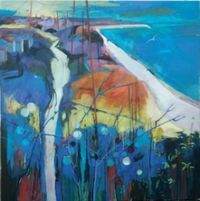 John Patchett is a well known Norfolk artist who works in soft pastel. He is noted for his vibrant paintings of Norwich market though he does many landscapes, cityscapes and seascapes. he will demonstrate from sketch to finish, probably, giving tips on use of soft pastels along the way. Members had the opportunity to watch a demonstration by John Glover of a portrait in oils. You will remember that last year he did a portrait in pastels for us. This time his subject was our vice chairman Eleanor Alison who made a very good model. In a limited time he produced an excellent likeness alla prima and had everyone completely engaged in his process. Thank you John.